A Golden Age of New Music? Luckily we don't often consider that we are fragile biological creatures situated on a small blue planet hurling at breakneck speed through a vast universe. We tend to go about the daily activities of life living in the moment without constantly observing larger patterns that can stretch across a lifetime. Neither do we think persistently about the occasional and subtle patterns that may emerge from a drone of background noise therein. But on occasion we become acutely aware that our world has changed in a significant way. I've observed that the gradual evolution of cultural norms present throughout our lives is punctuated on occasion by more explosive events that at times can purposely dislodge and unroot our pre-existing systems of aesthetics and stale ideas. I've lived through at least one such transformation of musical aesthetics, and that was in the late 1960s and into the early 70s. At the time radical change seemed quite expected (although a little crazy), but in retrospect the paradigm shift was a true and valid reflection of the era. I can only imagine what it must have been like to have been present through other significant artistic movements throughout the course of history. Perhaps the inhabitants of those intermittent zeitgeists experienced a similar sense of loss, excitement, and/or confusion as what we have seen in more recent times. In the end, you can only adequately judge and evaluate change from what came before and what will actually occur after. Living in the moment doesn't provide a comprehensive-enough mental map for the long journey - which in practice can take a lifetime to traverse (albeit, in the 20th and 21st centuries, cultural-disruptions have occurred at a higher rate of frequency). I'm still quite unclear about where the current culture and business of "new classical" music may be headed (excuse the imprecision of my terminology, but the explosion of genres and sub-genres has made terms such as "new classical" virtually useless). I've tried to speculate about where the road leads, but I am not in a position to see through the trees to a clear path of the future. I also doubt that there is one path, one solution, or a predominant "ism" to subscribe to. As a humble lone-practitioner, I simply (and perhaps naïvely) choose to compose music that interests me; what I want to hear: and to some extent what I have not heard enough of in the biosphere of our current new music discourse. But if we step back and look at the large forces at play - the activities of music creation (be it live performance or recorded), the present time is notable for its creative energy and unrelenting intensity. As a composer, I obviously have my personal biases and may not be qualified as an objective observer of all music composed today. I honestly can't judge it, or make proclamations - one way or another - about its relative value or non-value. I'm too busy as a composer simply "doing my thing" to take on such a socially complicated and politically-fraught assignment. But one thing is for sure. New music as a creative endeavor in our modern world is not dead. In fact, if we just look at the activities that comprise and define the business of new music, we could conclude that we live in a "Golden Age" relative to the recent past. In my lifetime I have not seen such a high level of ability, dedication, and talent as we have as we have today. This situation appears to be true pretty much everywhere in the world. The number and quality of both mainstream and new music specialist musicians has exploded beyond the point where I can track or keep count. There are literally so many young virtuosic performers, ensembles, and orchestras dedicated to new music active today that I can't list, catalogue, or name a majority of them. I hesitate to highlight even a few of today's superstars, since I would undoubtedly overlook someone, or some well-deserved music ensemble or organization in the process. 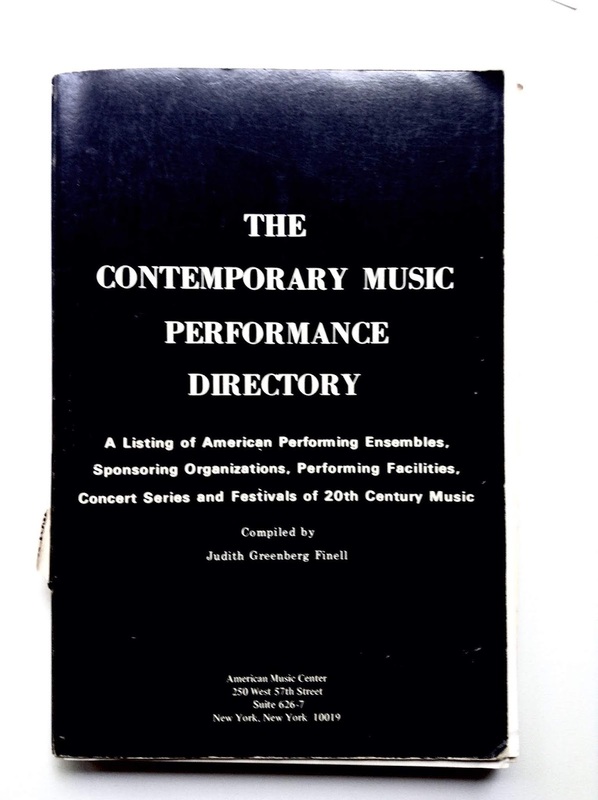 In 1975 the American Music Center published The Contemporary Music Performance Directory. For the time it was a milestone work. It brought together in one place all of the resources related to new music performance in the United States. It listed the major performing ensembles, sponsoring organizations, performing facilities, concert series, and festivals that featured 20th century music in North America along with information about how to contact them. It was all-in-one paper-bound black book, and it contained just about everything a composer could need in 1975. It was a go-to Bible of sorts. If we jump ahead 43 years in time and compare what was the status quo in 1975 against what our current performance environment looks like, the contrast is stunning. I doubt that a comprehensive, up-to-date printed directory of new music performance could be compiled today given the sheer volume of information and veracity of change. From what I see on the Internet and in social networking, new music specialist performers, concerts, events, festivals, and venues have multiplied and flourished well beyond what anyone can easily keep track of. It's a musical "Embarrassment of Riches." And what I see online and in the field is only the tip of the iceberg. It's true that our conservatories and universities have supported, encouraged, and contributed to the new found wealth of musical exploration in the 21st century. The number of composers graduating worldwide with degrees in music composition every year is in the thousands. That's quite a change from the 1950s, 60s, or 70s. The number of performers either interested in (or completed dedicated to) new music has also flourished under the auspices of higher education. They've done (and continue to do) their part. And while first and second-tier orchestras have perhaps fallen a bit behind with their overall support of new music, I see many more contemporary works scheduled on mainstream programs that I ever have observed in the past. Even opera - perhaps the most expensive and extravagant forms of performance art - has come a long way over the past decades. Not only are the complex and difficult operatic productions of the late-20th century routinely performed throughout the world today, new operas are commissioned and produced quite regularly. While I've never met a composer who feels they receive too many commissions or too many performances, there are now quite a number who can make a decent living working in their chosen profession. It's no longer a foregone fact that a piece of music will rarely if ever be performed again after its initial premiere (this had been common practice in years past - even for well-established composers of national and international reputation). The number of venues and types of venues has expanded significantly as well. There is now a flavor of new music experience for every taste - from the traditional concert hall to the boutique bar room. All in all, as I look around today, the number of talented musicians performing new music (and the high level of their talent, dedication, and musicianship) is simply staggering compared with what I recall from just a few decades ago. Efforts to increase audience size and enhance funding (from both public and private sources) will continue, as it always has, in the endless effort to present music to the public. That's a given. Overall, the creative new music scene of today (for those who live and work in the industry of new and experimental music) is healthier than it has ever been. At least that's how it looks from here.